Hello everyone! 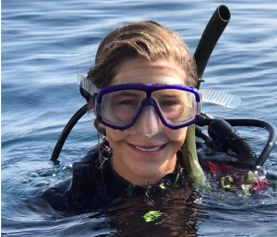 My name is Emily, and I am a Ph.D. candidate in the Ecology and Evolutionary Biology Department at UC Los Angeles and a 2018 Graduate Fellow at the Wrigley Institute for Environmental Studies. I am interested in all things conservation, but particularly focused on the marine environment. If you’re reading this, you and I hopefully share some interest in the ocean. Perhaps, like me, you enjoy spending more of your time below water than above it. Have you ever explored a giant kelp forest (see photo below) and met all of the colorful organisms that call it home? It is quite a transformative experience, and one of my favorites. Sunlight peeking through a kelp forest canopy close to Wrigley Marine Science Center. 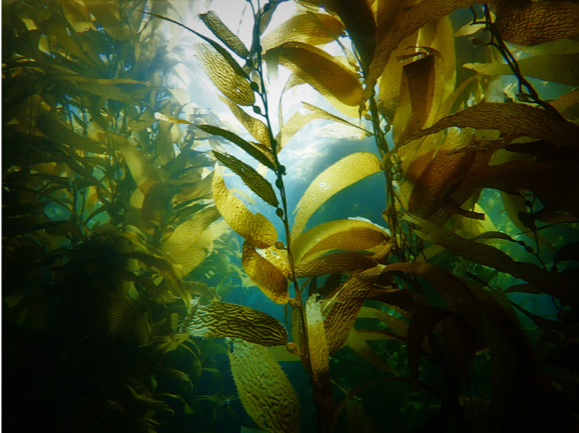 However, many ecosystems, including these beautiful kelp forests, are threatened by an alien invader - Sargassum horneri. S. horneri is a brown alga native to Japan and Korea that was transported (likely via human activity) from its native range to Long Beach Harbor, where it arrived in 2003. Since its arrival, S. horneri has rapidly spread up the coast towards Point Conception, throughout the Channel Islands, and south into Baja California. Where it is able to establish, S. horneri is capable of forming dense monocultures that are hypothesized to be outcompeting native algae for space and light, including the lovely giant kelp, triggering a cascade of negative impacts for organisms that call kelp forests home. Recent attempts at eradicating already established populations of S. horneri have found that the invader actually bounced back with even more fervor post-removal, meaning that widespread eradication of populations that have existed for multiple generations is likely not feasible. However, removals may be more effective in recently invaded areas. Thus, these vulnerable communities should be targets for monitoring and control. Which leads me to my research! 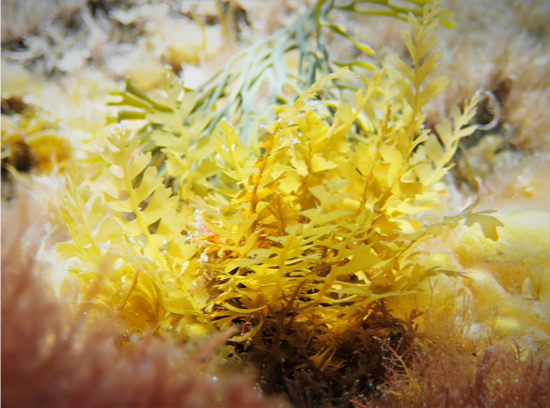 Recruit Sargassum horneri (center) surrounded by other algae. One aspect of my dissertation is seeking to investigate factors that make communities more vulnerable or resistant to invasion. Previous research using long-term data from UC Santa Barbara found that communities that had a diverse algal community or had dense urchin populations were able to inhibit S. horneri from successfully invading due to intense competition or herbivory, respectively. Thus, my research is testing these conclusions in the field, as well as trying to figure out whether the same factors are at play on Catalina Island, where S. horneri has rapidly and widely established. I currently have several study sites that vary in the important factors aforementioned to test the hypotheses that sites with strong competition (via algal diversity) and/or dense urchin populations (via herbivory) will be most resistant to the S. horneri invasion, while sites lacking those features will be the most vulnerable. I have deployed growth experiments with S. horneri at each site, with half of the experimental units in cages specially designed to prevent urchin herbivory while allowing other types of herbivory to occur. Photos of my experimental units, with uncaged S. horneri (left) and caged S. horneri (right) with some curious garibaldi. Comparing growth inside and outside these cages will help me determine the strength of urchin herbivory at each site as well as the influence of competition. I expect S. horneri will grow the most at the most vulnerable sites, and the least at the most resistant sites, and I am excited to see the results! I spend a good amount of my time in/on the water to conduct this research, sometimes completing up to 8-9 scuba dives per day. Many times, these dives are short, often to clean the cages of any fouling with a nifty scrub brush and make sure the algae are happy. While not super exciting at times, I wouldn’t trade it for anything. I hope my research will provide insight into factors controlling or facilitating the success of the S. horneri invasion and inform management as to which types of vulnerable communities to monitor so S. horneri doesn’t proceed to take over the world, or at least the rocky reefs of Southern California! Special thanks to the Wrigley Institute for giving me the incredible opportunity to conduct this research, and all the dive/waterfront/lab/advising help I’ve received for this project. Feel free to contact me at emilyryznar@gmail.com with any questions. Stay soggy! Me, almost always soggy. Photo credit: Dena Decker. This entry was posted in Graduate, Wrigley Institute on November 2, 2018 by Jessica Dutton. ← Summer = Sunshine = Solar Energy for Microbes!